The frequent rain and thunderstorms moving through Pennsic resulted in the cancelation of the armored and rapier woods battles scheduled for yesterday due to safety concerns. Armored bridge battles were fought in the morning instead with three points going to the East and two to the Middle. The rapier ruins battle was scheduled to take place in the afternoon but it and the siege weapon war point were canceled due to lightning. The rapier ruins battle will be fought at its originally scheduled time tomorrow. The siege war point may be rescheduled to occur at the same time as the rapier ruins battle. The Archery Champions shoot occurred today with the point going to the East. East Kingdom court was held this evening. Among many other items of business, Their Majesties awarded the Tyger of the East to Duke Gregor von Heisler. Pennsic War 43 Dates are announced and official. Troll opens on Friday, July 25, 2014, at 12:00 noon for Land Agents and site closes Sunday, August 10, 2014, at 3:00 p.m. 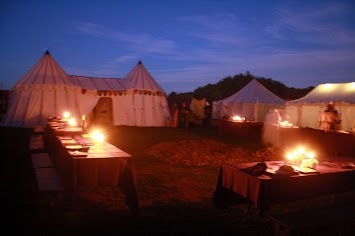 Check the page at a later date/time for more information regarding Pennsic 43 (2014). As of the posting time, there are 325 days, 1 hour, and 13 minutes left until Troll opens.